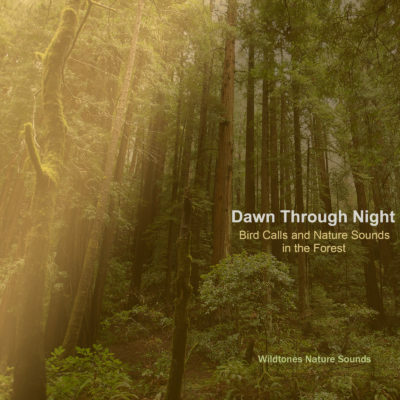 Immerse yourself in a day of relaxing nature sounds from the Northwoods, from dawn through night. Stream beautiful morning bird songs, birds calling by the brook, thunder storms, frogs and spring peepers after the storm, owls calling deep in the woods at night. Our 22 tracks are calming and restorative and many can be used as loopable sleep tracks and natural white noise for background or meditation. If you like birds — Wood Thrush, Cardinal, White-throated Sparrow, Baltimore Orioles, Barred Owl, Mourning Dove, White-breasted Nuthatch, Raven and Crows, and even Pheasant are heard. Chorus Frogs and Spring Peepers make the experience of evening in the forest complete. Find these tracks on iTunes, Apple Music, Amazon Music, Napster, Spotify and many other download and streaming services.